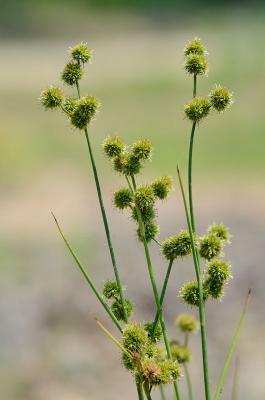 Juncus brachycarpus.© Gary P. Fleming.Atlas of the Virginia Flora.2014. Virginia Botanical Associates, Blacksburg. www.vaplantatlas.org (Accessed 5/2014). Juncus brachycarpus is a perennial rush 30-80 cm tall, stems from along a stout white, rhizome. Leaves usually 2, round, internally partitioned. Flower heads round, 2-10, 0.7-1 cm wide, densely flowered, bristly, flowers dull brown to pale green, sepals 0.3-0.4 cm slightly longer than petals, both narrowly lance-shaped, stamens 3, shorter than sepals; inflorescence branched, longer than bract leaf below it. Fruit capsule 3-sided, tip pointed, much shorter than petals or sepals, internal partitions incomplete, June-Sept. Frequency in NYC: Very infrequent (NYS endangered (USDA, NRCS 2010). Habitat: Bogs, wet soil, soil pH 4.5-6.7 moderately tolerant of shade (USDA, NRCS 2010).